Elite athletes in the making. 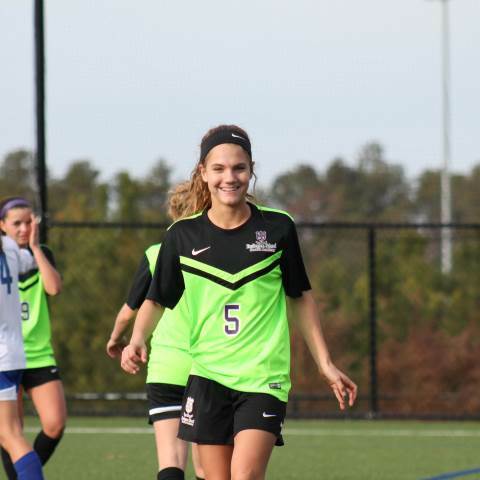 Darlington School Soccer Academy enrolls highly motivated student-athletes who share a common goal – to obtain a premier college-preparatory education and elite soccer training within a single, competitive program. The vast majority of our graduates go on to play in collegiate soccer programs across the United States. Become the player you were meant to be. Darlington School Soccer Academy integrates a strong academic curriculum, state-of-the-art speed and agility training equipment and facilities, and professional instruction help you reach your highest potential. Our nationally licensed coaches have designed an intense training regimen and competition schedule that will prepare you for college and beyond. Player videos and profiles coupled with our strong network of college coaches are essential tools in the recruitment process. Darlington School Soccer Academy has established relationships with U.S. Soccer, West Ham United International Academy, the NSCAA Coaching Education Academy, Fc Utrecht, Wolverhampton Wolves and other well-known soccer entities. The Academy competes as a U.S. Club Soccer team in club friendlies, U.S. Club Regional and National Championships, college showcases, nationally recognized tournaments and collegiate level scrimmages. Every two years, the Soccer Academy travels abroad to expose players to international competition in tournaments and friendlies. Opportunities are also available with the ECNL, the Olympic Development Program and U.S. Club id2. In addition, our all-weather turf and sport performance facility guarantees that our student-athletes have the opportunity to develop the entire school year. I am deeply passionate about the game of soccer and thrilled to work with the student-athletes and amazing staff of Darlington's Soccer Academy. We all strive to help each athlete achieve their highest potential and give them opportunities to go beyond their own expectations. Who can participate in the Soccer Academy? Boys and girls in middle and high school, including both Darlington and non-Darlington students, who are interested in maximizing their personal development and soccer skills may apply for the Soccer Academy. What advantages will a student participating in Darlington School Soccer Academy have over players? Soccer Academy players train more per week than the average club soccer player. This intense training combined with Darlington School’s academic environment prepares any student-athlete for the rigors of college. What events or showcase tournaments do you attend? Darlington School Soccer Academy participates in several of the largest youth tournaments in the country. The team has participated in CASL Showcase, Disney Showcase, Miami Orange Classic, Adidas Final Four Showcase, Dallas Sport Source Showcase, Nike Norcross, Atlanta Cup and many more. They also travel and play many colleges across the Southeast. What league or soccer association does the Soccer Academy participate in? Darlington School Soccer Academy participates as a U.S. Club-sanctioned program that is a separate organization under the United States Soccer Federation. It does not participate as a USYS club. How often does the Soccer Academy train? The Soccer Academy trains five days a week. Approximate training time is Monday through Friday from 4 to 6 p.m.
What is the typical training session like? Each session begins with a good warm-up that encompasses speed and agility as well as technical development. Most every session ends with competitive games built around the training topic of the day. How much does it cost to participate in the Soccer Academy? The participation fee is $3,500 per year, which includes training, US Club registration, Nike Soccer Academy gear, recruiting assistance, college guidance, tournament/showcase entry fees, college scrimmage opportunities, team tactical video analysis and video footage of games. Travel is not included. Do many of your players compete at the next level(s)? College or pro? Darlington School Soccer Academy has had tremendous success placing its alumni at various levels of play, including NCAA Division I Top-20 programs, NCAA Division II and III, and international professional opportunities. Currently, the Soccer Academy has placed 98 percent of its alumni into the college ranks, with two former members currently playing professional soccer. Where do your players train? Darlington School Soccer Academy players train on Darlington’s six well-maintained playing fields. Players have complete access to the Huffman Memorial Athletic Center, a 96,000-square-foot facility with an indoor track, weight room, swimming pool and four courts. What type of medical support do the players receive? Darlington School has a contract with Floyd Medical Center to provide medical services. Floyd provides full-time athletic trainers, physical therapists, orthopedists, and weekly doctor’s visits for our students and players. What type of college guidance do Soccer Academy player receive? Each player meets with the training staff to formulate a plan of action for college recruiting. This includes his or her individual player profile, letters of recommendation, as well as follow-up emails and telephone calls by the coaches. In addition, Darlington School Soccer Academy has the ability to compile and share video highlights with college coaches. All players who are Darlington students are also supported by the school’s full-time college guidance staff. Where do boarding students who enroll in the Soccer Academy live? Can players participate in the Soccer Academy without being enrolled in the residential program? Darlington School Soccer Academy accepts students who attend Darlington as well as players in surrounding counties who desire to improve their soccer education and play at an elite level. For more information, please email Soccer Academy.